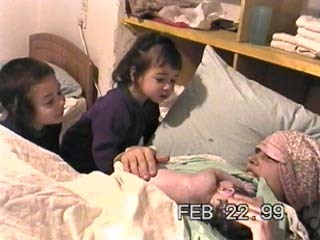 Simcha Layah gave birth to him at 6:23 a.m., this morning, Monday, the 6th day (Vav) of Adar, February 22, 1999, in her own bed, in our home here in the holy city of Tzfat. His weight was about 3.6 Kilograms (about 7 pounds 15 ounces), according to our midwife. Both are well, thank G-d. He will be named at the Brit Millah, which will take place, B'Ezrat Hashem, on Monday, one week from today, the 13th day (Yud Gimmel) of Adar, Ta'anit Esther, the day before Purim. 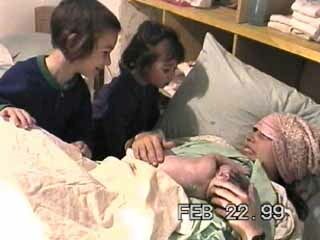 In the attached pictures (I couldn't decide on which one of two to show you from video), you will see not only Simcha Layah and the newborn baby, but also David and Hannah, who awoke to the baby's first chirpings, and are fascinated, only moments after its birth!